The Kamov Ka-31 (NATO reporting name 'Helix') is a military helicopter developed for the Soviet Navy and currently in service in Russia and India, China in the naval airborne early warning role. 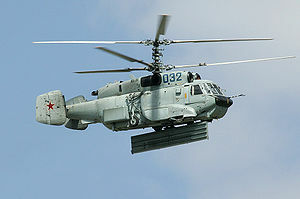 As with all Kamov helicopters except the Ka-60/-62 family, the Ka-31 has co-axially mounted contra-rotating main rotors. The airframe of the Ka-31 is based on the Kamov Ka-27. One visually distinctive feature of the Ka-31 is the large antenna of the early warning radar, which is either rotating or folded and stowed under the fuselage. The second is the reduction of the bulky electro-optical sensory suite beneath the cockpit. The landing gear retracts in order to prevent interference with the radar. The Kamov Joint Stock Company (then, Kamov DB), began development of the Ka-31 medium-weight naval helicopter in 1980 and the first flight took place in 1987. This development was the direct result of the cancellation of the shipborne Antonov An-71 AWACS aircraft. The An-71 was intended to be deployed on the Soviet Navy's first true aircraft carrier, Admiral Kuznetsov (then known as Tbilsi). The An-71 was cancelled in favour of the Yakovlev Yak-44. Though Yak-44 was in development (and not yet cancelled) at that time, the Soviet Navy wanted a stop-gap measure and began investigating other viable platforms to act as an AEW, on sea. With the wealth of knowledge in operating shipborne helicopter operations, the Soviet Navy selected the tested and reliable Kamov Ka-27 airframe. The Kamov Design Bureau was already in the process of developing the Ka-29. Nizhny Novgorod Radio Engineering Institute was working on a Radar Design to be used on the An-71, the same design (with suitable changes). So they were all mated in 1980 and the design was known as Ka-29RLD. The radar development took time, and it was not until 1987, did the first flight took place. The production version of the Ka-29RLD/-31 was very different from the Ka-29 from which it was derived. The removal of the bulky electro-optical sensory suite, beneath the cockpit. The cockpit is wider than the KA-27/29, with 2 additional MFDs. The ASW capability is not installed. The addition of Kronstadt Kabris 12-channel global positioning system. 16-channel digital communication gear with range up to 250 miles (400 km). Some of the engineering changes from Ka-29 are, the change in powerplant, the addition of the APUs and most importantly the secondary Hydraulic system. The radar is the E-801M OKO ("EYE") designed by the Nizhny Novgorod Radio Engineering Institute. The operational variants delivered also had a Flight Information Recorder designed by the St.Petersburg/Leningrad Electrotechnical Institute, fitted in the tailcone. By the time the Yak-44 was canceled, additional responsibility of Command & control fell into the KA-29RLD/Ka-31's hands. Though officially designated as a radar picket, many upgrades have uprated it to a AWACS class craft. The development and trials began in 1987 in earnest, but they were plagued by the political turmoil and the defense budget cuts in the late 1980s and the early 1990s. Finally the aircraft entered service in very limited numbers with the Russian Navy in 1995 with its Admiral Kuznetsov class aircraft carrier and Sovremenny class destroyers. The Indian Navy ordered four Ka-31 radars in 1999, and a further five in 2001. Full-scale volume production of the helicopter started in 2002. The first batch of four entered service with the Indian Navy in April 2003. The second batch were delivered in 2005. With the Indian Navy becoming a one carrier navy, it not only operated the helicopters from aircraft carriers and destroyers, but also from its shore-based naval air stations. The operation with the Indian Navy revealed a major drawback of the aircraft, its limited endurance/range, the chief element of a Taskforce/Battlegroup. So, HAL was commissioned to experiment and possibly adapt a helicopter-to-helicopter refuelling system. Also, in the Indian service, the aircraft received Abris GPS system featuring a 12-channel receiver and option to employ Differential GPS references, designed by the Kronstad itself. The later batches featured navigational equipment for digital terrain maps, ground-proximity warning, obstacle approach warning, auto-navigation of pre-programmed routes, flight stabilization and auto homing onto and landing at the parent carrier/base and information concerning the helicopter's tactical situation. First rumored in early 2010 that PLAN acquired at least one Ka-31 AEW helicopter for evaluation. A total of 9 were reportedly to have been ordered. The helicopters are expected to be stationed on-board the Russian and indigenous aircraft carriers which are under construction. The first helicopters were delivered in November 2010.